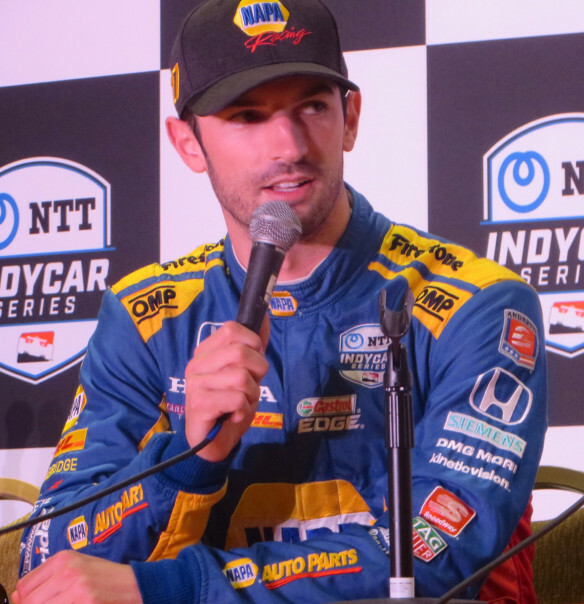 The lap times fell fast Saturday morning for the third NTT IndyCar Series practice session at the 45th Acura Grand Prix of Long Beach. It was already 65 degrees F at 9am and all 23 drivers went faster in this 45-minute session than they had in the previous two. All but two drivers got down to the 1:07’s, compared to four on Friday afternoon. The qualifying track record of 1:06.2254 was set by Helio Castroneves in April 2017. 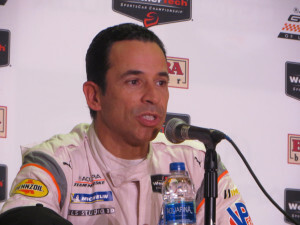 Friday afternoon at Long Beach Castroneves, now racing an Acura for Team Penske in the IMSA WeatherTech SportsCar Championship, broke the IMSA DP1 track record and is on pole for Saturday afternoon sprint race. 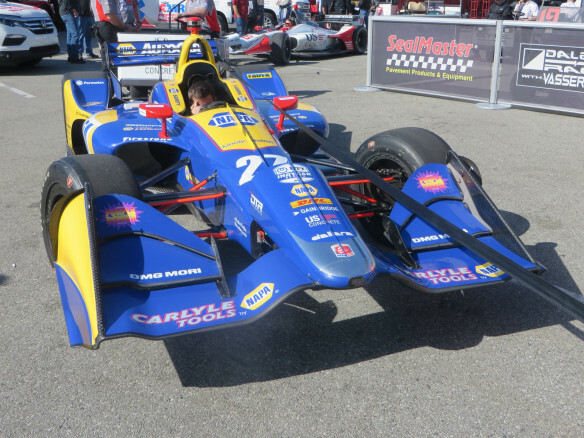 With only seconds to go, Alexander Rossi/No.27 NAPA AUTO PARTS Andretti Autosport Honda laid down the fastest lap of 1:07.0588. He pipped Graham Rahal/No.15 Total Rahal Letterman Laningan Racing Honda who had just hit the top of the charts with two minutes remaining. The top Rookie was Colton Herta/No.88 Harding Steinbrenner Racing Honda, in seventh position. The top ten were Rossi, Rahal, Scott Dixon/No.9 PNC Bank Chip Ganassi Racing Honda, Ryan Hunter-Reay/No.28 DHL Andretti Autosport Honda, Simon Pagenaud/DXC Technology Team Penske Chevrolet, Joseph Newgarden/No.2 Hitachi Team Penske Chevrolet, Herta, Rookie Felix Rosenqvist/No.10 NTT DATA Chip Ganassi Racing Honda, Rookie Patricio O’Ward/No.31 GESS Carlin Chevrolet, and Will Power/No.12 Verizon Team Penske Chevrolet. The session was caution-free with no drama. Next up for IndyCar will be afternoon qualifying for Sunday’s 85-lap race. Jon Ikeda, Acura Brand Manager, met with the media. It’s only been 65 days from the time Acura was announced as the title sponsor for the 45th running of the street race. Ikeda worked in Honda R&D for 26 years before moving into Sales. With Acura being the performance division of Honda, it wanted to refocus on the performance aspect of the brand. Honda started with the NSX car, and then moved into IMSA with Team Penske’s DPi program. Now Acura is the title sponsor for the Long Beach race. Ikeda lauded Toyota’s curating the race over the years; and praised the city of Long Beach and promoters of the race and their working with Acura to make the title sponsorship happen. 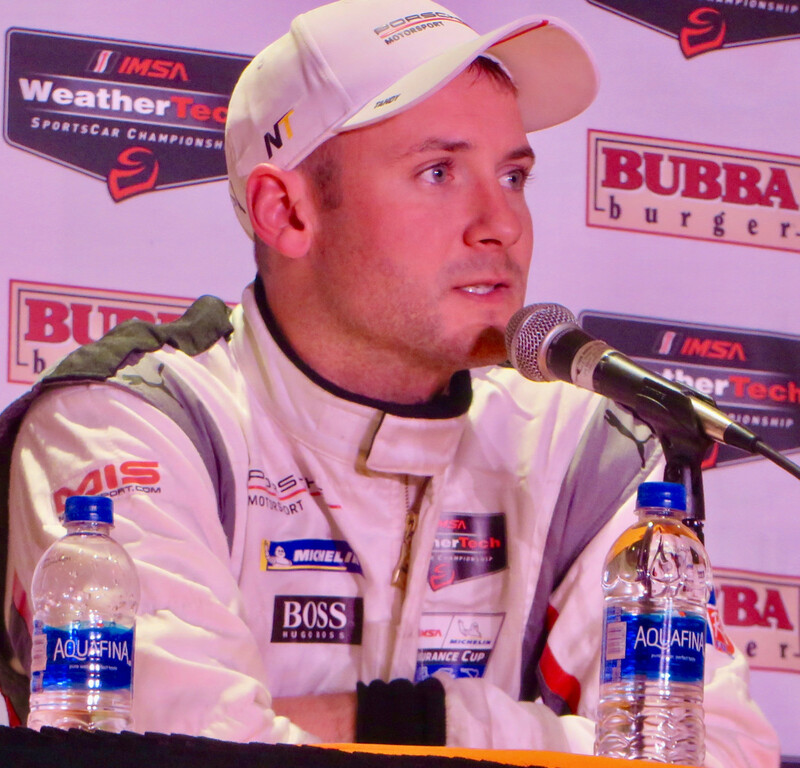 He said it is a great foundation to build on, and Acura feels it can add new things and dimensions to what the race has been about. One way Acura is putting its imprint on the race is changing the Toyota red and white color scheme to blue. And over time, Acura would like to do some new and different things, amplify and innovate, bringing in whatever is new and enhance the whole experience. Helio Castroneves/No.7 Acura Team Penske Acura has the DPI pole for Saturday’s BUBBA burger Sports Car Grand Prix at Long Beach. He had a record-breaking time of 1:11.332. He broke the record set last year by his Penske teammate, Juan Pablo Montoya. “Records are hard work and meant to be broken.” He was super pumped about the significance of his pole. “The Acura. What a great combination to be in an Acura at the Acura Grand Prix. There are a lot of people to be here.” Castroneves’ co-driver is Ricky Taylor. 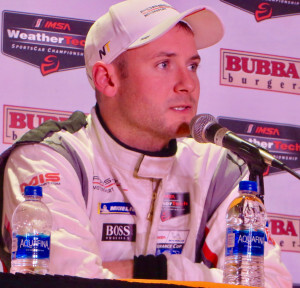 When asked about his former fellow IndyCar driver, Sebastien Bourdais, doing double duty this weekend, Castroneves said it was more natural for Sebastien to be jumping from one car to another as he drove sports cars on a more regular basis. However, Castroneves did admit to carrying a separate helmet and suit with him to double series weekends. There are nineteen IMSA cars, and 11 have in-car cameras. The race is Saturday at 2pm.